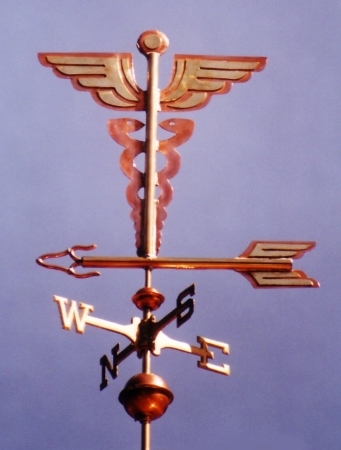 This Medical Insignia Weathervane is made of copper and brass and is crafted in the silhouette style. As this sculpture piece weathers the different metals will age with a subtle difference in tone that will be very lovely. This caduceus, a traditional symbol of healing, was originally commissioned to be mounted in the sculpture garden at Garden of Hope, Bethlehem, PA. The 1902 adoption of the caduceus for U.S. Army medical officer uniforms popularized the symbol throughout the medical field in the US. The caduceus is sometimes erroneously used as a symbol for medicine, especially in NorthAmerica, due to confusion with the traditional medical symbol, the rod of Asclepius.